Otherside Entertainment just revealed a new look at System Shock 3 at this year's GDC. However, it's actually another company called Nightdive that's responsible for bringing the franchise back from the grave. Here's how they did it. This feature originally appeared in issue 281 of Game Informer. In 1994, a Cambridge-based developer named Looking Glass Technologies released System Shock, perhaps one of the most influential games of its time. The game combined first-person shooter with role-playing systems, encouraging the player to proceed with caution through a space station’s dangerous corridors and think carefully about their every move. In 1999, Looking Glass released a sequel shortly before closing its doors; Irrational Games, which worked on System Shock 2, carried on the design of the series with the critically acclaimed BioShock. 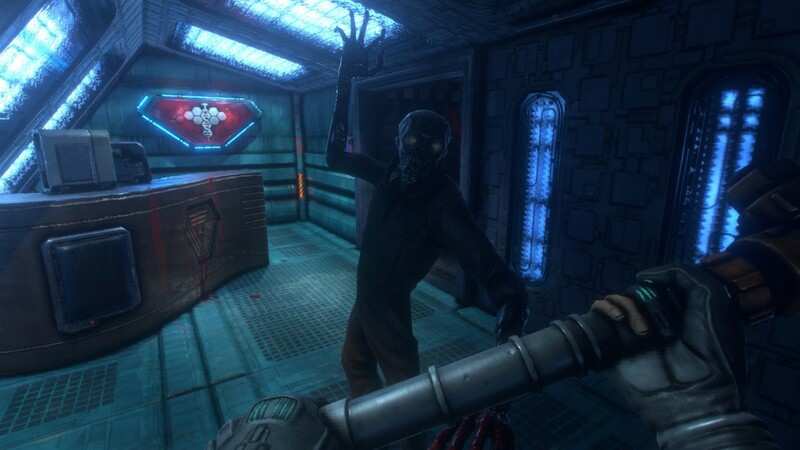 Now nearly 13 years later, a Kickstarter for a remake of the original System Shock has raked in over a million dollars, and a third game in the series is being developed by a team made up largely of developers who worked on the original. The roads behind the series’ sudden resurgence lead back to Nightdive Studios, a small and dedicated team that has, up until this point, dealt solely with acquiring older games, like Turok and The 7th Guest, and making them playable on modern PCs. Four years ago, Stephen Kick and Alix Banegas were on a trip of self-discovery in Mexico and close to broke. Now not only do they have the keys to the System Shock franchise, but they’re remaking the original from the ground up. How they got there is quite the story. The pair quit their jobs and packed up the car before heading down to Mexico with no concrete plan except to just wander for a bit. “We crossed the border into Tijuana and just kept on going, all the way across Mexico,” recalls CFO Alix Banegas. The two were in Guatemala when Kick tried to play System Shock 2 on a notebook laptop he had brought along to revisit some of his favorite games, but quickly encountered obstacles. That question eventually led Kick and Bane gas to form their own business dedicated to letting customers play games thought to be lost to the ravages of time. According to Kick, Star was wary about doing anything with the rights due to how expensive it would be to create a sequel. Kick went another route, pitching them on re-releasing System Shock 2 in a playable state on Steam and GoodOldGames.com (GOG). He showed them the sizable wishlist for the game on GOG as evidence that there was a demand for such a re-release. He eventually persuaded Star with the potential profit and borrowed money from friends and family to pay for the licensing fee. Around the same time, Kick discovered an anonymous modder had created a patch that made System Shock 2 playable on modern systems. “I had already been in contact with friends and programmers to create a team to make this work, and this person in France had basically released this file so that all you had to do was stick it in the system directory of System Shock 2,” Kick says. The newly formed Nightdive started focusing on acquiring adventure staples and cult classics from the ‘90s. Four years later, the studio has touched up and released nearly 100 titles including Turok, The 7th Guest, and Sword of the Samurai. Kick says they ended up using the studio’s profits to purchase the rights to Sys tem Shock from Star Insurance in August 2015, fully intending to remake the original game. “We had such a wide network of artists, programmers, developers that we could light the Flame of Gondor and everyone would come,” Kick says. “It was just a matter of these pieces falling into place so we could get started.” It turns out he wasn’t wrong. The Kickstarter campaign boasts recognizable talent from across the industry, including Chris Avellone, a designer who worked on Baldur’s Gate and Fallout: New Vegas, as well as the concept artist for the original System Shock, Robb Waters. The majority of the development team is remote, with members working from San Francisco and New Zealand, while Banegas and Kick continue to run Nightdive out of their home in East Vancouver. Bad Day on the Midway isn’t the only game lost to time, as Nightdive has also been unable to acquire the rights to other classics, though Kick refuses to say that these are lost causes. “Part of my whole mission is to just not be indiscriminate with which games we bring back, to give everything a fair chance,” he says. “But if it’s too cost prohibitive, we kind of have to put it on the back burner for -a -while.” Though Kick and Banegas plan to keep on touching up and re-releasing games, right now the company’s priorities lie with making the System Shock remake a reality. A great deal of anticipation and expectation both fuels the project and creates unique obstacles, but the duo are excited and ready for the challenge of bringing series back to the spotlight – in more ways than one. Nightdive Studios has carved out a strange, unique path for itself, one that could have only happened with the opportunities offered by the era of digital distribution. While the developer has proven itself as an outfit capable of preserving games thought to be lost, whether or not it can create a quality game from the ground up is still a question yet to be answered. However, the studio’s passion for revitalizing the past for a new generation to enjoy is unmistakable and a necessary foundation for pulling off the Herculean task of not just restoring a masterpiece but making it as shockingly good as it was all those years ago. For more on System Shock, be sure to read my primer on the series here.